Jack was born in Swampscott MA and graduated from Phillips Exeter Academy, Class of 1940. He entered Yale University in the fall, but soon left Yale to enter officer training school for the Army. Jack served in Germany, where he was involved in the liberation of the Ludwiglust Concentration Camp. He was then sent to the Pacific Theater and served in the Philippines. 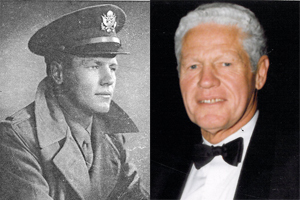 After the war, he was decommissioned as a Captain and returned to Yale to graduate with the class of 1944W in 1947. Jack received his MBA from Harvard Business School in 1949. He had several jobs, but was restless and wanted to be his own boss. After much soul searching, and at the advice of Howard Grimes, he entered the life insurance business as an agent for the Aetna Life & Casualty Insurance Company. Jack quickly rose to be one of Aetna’s top national life insurance producers. Jack then formed his first partnership with Robert Mustard and Coughlin-Mustard was established as a life insurance brokerage agency. In 1981 Howard Grimes, Jack’s longtime neighbor and friend, retired from Aetna as a Senior Vice President and together they joined forces to form Benefit Services Incorporated. The operation moved to Copley Square Boston in 1983 and Jack’s son, Bruce, already an established life insurance agent with Aetna, officially joined the firm. In 1987 Benefit Services Incorporated moved to its present location in Wellesley Hills. where Jack resided and where, along with his wife Jacquie, he raised five children. Jack retired from the agency in 1995. He split his time between Lake Sunapee NH and Jupiter FL playing golf and tennis and enjoying his large extended family.